One day you might come across a puzzle that is almost like something straight out of one of Agatha Christie’s works or like one of Sherlock’s cases. Some are even more difficult because there are barely any clues which could help you identify the perpetrator. When all that’s available are a few traces of the culprit, your own instincts and intuitive abilities, and speculation is rife, the case become a true test of your judgment and you’ll be able to observe how your personality leads you to the choices that you will make. Here’s an interesting puzzle which only offers you the bare minimum to solve it. Nothing in the picture will serve as an exact clue that can help you catch the perpetrator. Everything hinges on what is visible to you and whatever you choose to note as evidence. Imagine that you are the mom and observe the children closely. 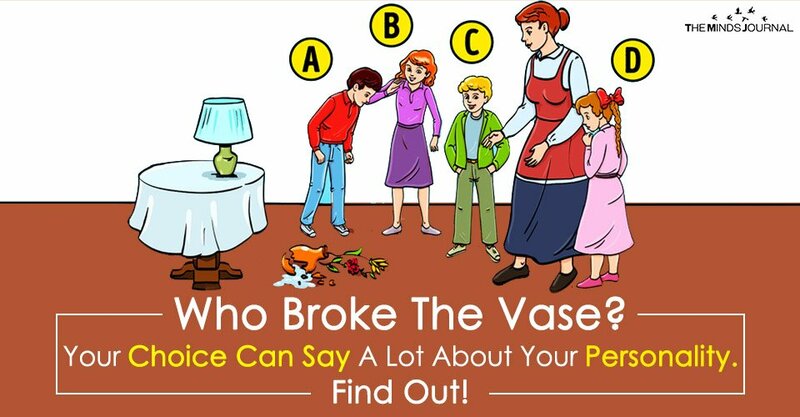 Choose the one you think is most likely to have broken the vase. What does your choice say about your personality? This child looks like he’s the one most likely to have broken the vase. His eyes are fixed to the floor and it looks like he is feeling guilty and remorseful about something he did. His placement is also different from the others because he is on the right with all the others placed to the left. The other children are all looking at him and it looks like they’re pointing to him as the culprit. But is this enough to figure out what really happened? The case may be that he’s being blamed for someone else’s mistake and is being victimized because there aren’t any other clues to say otherwise. His siblings might have also contrived to make him believe that he did do it. By choosing this child, you’ve revealed that you are a very observant person who doesn’t miss even the tiniest of details. Deceiving you is not easy because you are always watching others and mentally noting the changes in their behaviour and body language. Responsibility is your key characteristic and you exhibit it in all that you choose to do in life. All your decisions are carefully thought out and you’re not the kind of person who’ll rush into something without thinking it through. Girl B looks like she’s the eldest sibling and might even be old enough to babysit her younger brothers and sisters when their mom is working. Her dress is a bright pink and her gaze is directed at Child A. She’s looking at him like he is the one responsible for breaking the vase. But simultaneously, her look is also comforting and affection. She understands that a mistake has been made but she’s not passing judgment on anyone. You also look at life this way even if it doesn’t always work out for you. The importance of granting understanding and forgiveness to others and not being quick to pass judgments is not lost on you. Moreover, you are as aware of your own flaws as you are of the flaws of others. Whenever you’re presented with a problem, your practical and rational nature asserts itself and you head straight to the solution that is the most logical. Thus you’re able to fulfil almost all your aims at some point. If you believe that Child B is the culprit in this case, you’ve understood that the above mentioned traits are the ones you possess and you’ve accepted them.